A night of hilarious and over the top musical selections featuring casts from the 2012 season. 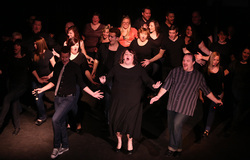 Solos, duets, and large group numbers will impress and leave you laughing for days. Songs from shows such as Book of Mormon, I Love You You’re Perfect Now Change, Edges, Spamalot, The Producers, and selections from our upcoming 2013 season. Also numerous unique solos and duets not found in any musical that you will be sure to enjoy. All the wonderful patrons who came to support the Arts!